Garlic knots don’t have to be difficult to be delicious! 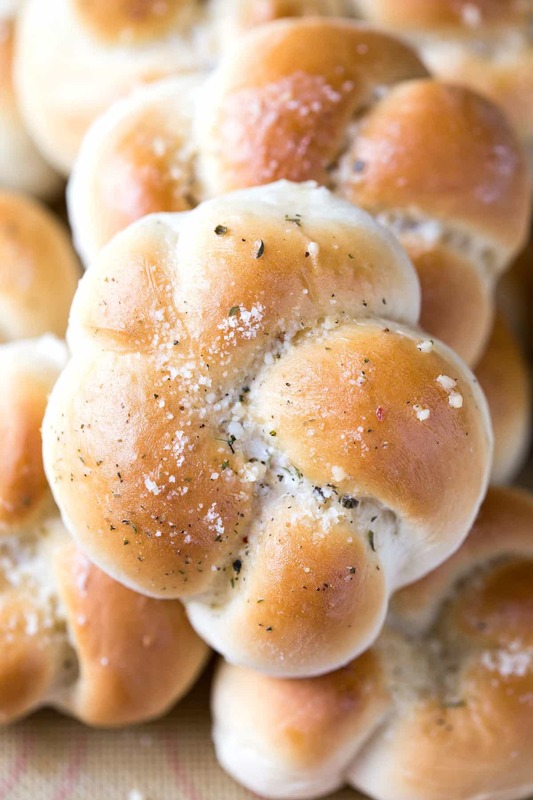 These 30 Minute Garlic Knots are super easy and are made from scratch in just half an hour. After I started making garlic knots, my son started requesting them all the time. They’re delicious, and we love them, but they take about an hour to make. All-in-all, not so bad for a yeast recipe. Since dinner time is always chaotic at our house, quick, easy recipes are my friend. So, I came up with a faster recipe to make garlic knots. These 30 Minute Garlic Knots are ready – start to finish – in just half an hour. And they taste so good that you’d never guess how easy they are! If you want to make it a meal, check out my easy homemade pizza dough recipe. 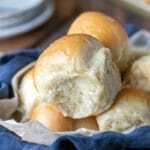 This is a great starter recipe if you’ve never made anything with yeast before. It’s pretty hard to hurt this dough (just don’t kill the yeast!). 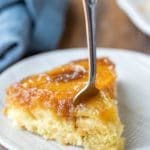 I think you’ll be pleasantly surprised at just how easy this recipe really is. And if you’d like a step-by-step tutorial on shaping the knots, check out my video below! More 30 minute bread recipes! If you’ve tried this 30 minute garlic knot recipe, don’t forget to rate the recipe and leave me a comment below. I love to hear from people who’ve made my recipes! Made-from-scratch garlic knots that are ready in just half an hour. Preheat oven to 400 Line a 9x13-inch rimmed cookie sheet with parchment paper or a silicone baking liner. Set aside. With lightly floured hands, shape dough into 12 knots, and place dough on prepared baking sheet. In a small bowl, stir together ingredients for garlic butter. 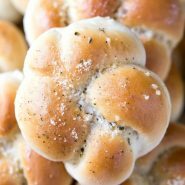 After removing the rolls from the oven, brush with garlic butter, sprinkle with cheese if using, and enjoy! If you would prefer to use active dry yeast, substitute an equal amount for the instant yeast. Let the mixture sit for 5-10 minutes, or until foamy. Then, continue with the recipe as written. 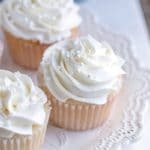 These are delicious, so light and fluffy. I had my daughters taste test them for me, because I wanted to serve them at an event. They all thought they were terrific. So, easy! I haven’t tried freezing them, but I think that they would freeze well. Hope that helps! I am a teenager and I just made these in like 45 mins and they were delicious 😋 I would 100% recommend these they were so easy! I halved the recipe to see if I liked them and I totally regretted halting it! You only need to use one packet of the yeast and they will turn out fine… mine did!!! I’m very confused where does the cheese come in to the recipe? The cheese is optional. You can sprinkle a little on at the end if you would like. 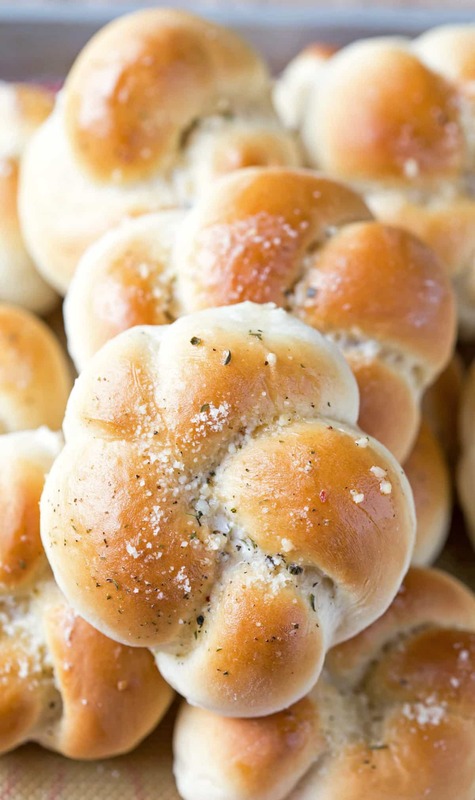 I eanted to make Italian for dinner and I usually do a garlic parmesan breadstick recipe I have somewhere but i couldn’t find it so i research The internet and found these nice looking knots. Recipe was easy fast. I had to go to you tube to learn how to make the knots because the video on the site didn’t work. But they were awesome and beautiful. This humble Puerto Rican family I wants to say thanks for the recipe. We loved it. I’m so glad that your family liked them! =) Thank you for letting me know that the video wasn’t working. I’m sorry that it wasn’t up and running, but I’ve gotten it to work now. Thank you for coming back to comment! Oh my stars! ! I love, love, love these! They’re going on our regular rotation. Thanks for the recipe!